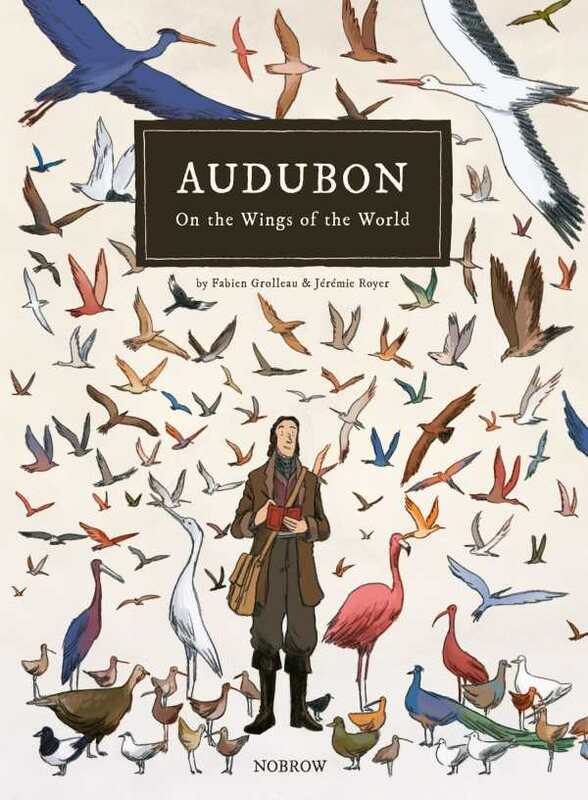 The name Audubon is synonymous with ornithology, but it’s the man behind the famous wildlife paintings that’s revealed in Fabien Grolleau and Jérémie Royer’s beautiful graphic novel, Audubon: On the Wings of the World. The environmentalism of Audubon’s era seems paradoxical by today’s standards; like Theodore Roosevelt after him, he shot and killed many creatures while attempting to draw attention to their beauty and emphasize the importance of conservation. This is shown subtly but effectively in Audubon, when he’s depicted shooting down a nesting pair of ivory-billed woodpeckers (a species now critically endangered) and culling from a huge flock of passenger pigeons (a species now extinct). But the book quietly makes the case in defense of Audubon—his was a different era with different standards, to be sure, but moreover, his paintings really did help to impart an appreciation for wildlife in America, particularly with regard to birds. Royer’s art and composition are superb, and it’s obvious that he, too, spent a lot of time looking at birds in order to produce his own striking illustrations. Royer’s most engaging drawings, though, are Audubon’s surreal dream sequences, incredible compositions that give more insight into the man than all the adventures retold in the book. Grolleau, meanwhile, has created a masterful blend of Audubon’s own writings and uses a bit of creative license (all explained in the notes at the end of the book). These imaginative assists to the narrative, such as a meeting and conversation between Audubon and Charles Darwin, may not be to the taste of sticklers for fact, but Audubon: On The Wings of the World is more than mere biography: it’s a book that leaves a lasting impression, in words and especially images, of a man whose legacy survives to this day.